Michael Jordan and His Efforts to Gain Control of His Trademark Rights in China - Gottlieb, Rackman & Reisman, P.C. Since the American Tobacco Company put baseball players on promotional cards in 1920, third parties have been appropriating the names and likenesses of professional athletes for profit. Fortunately for these professional athletes, there are several avenues in the United States by which they can control the use of their names and likenesses, including through the federal Lanham Act and individual state right-of-publicity statutes. Professional athletes have become more adept at using trademark law as a tool to prevent the misuse of their names and likeness on a worldwide basis. Michael Jordan, in particular, has been proactive in his efforts to protect his rights. He has filed numerous trademark and service marks worldwide and defended his name and likeness. In the United States, Jordan has built a multi-billion dollar brand based around his name. Almost 15 years after he retired, the AIR JORDAN division of NIKE is still one of its most profitable. One of the clear examples of Jordan’s enforcement efforts abroad was his action against a Philippine sport bar which bore the name Michael & Jordan, which featured pictures of Jordan’s iconic Jumpman logo and other poses inside the bar. The owner claimed that the bar was named that way because his children names’ were Michael and Jordan, but despite this the authorities ordered him to change the name of the bar due to Jordan’s action. In China, however, Jordan has encountered difficulties in protecting his name because the Fujian Qiaodan Company (Qiaodan) has owned the Chinese-symbol equivalent of Jordan’s name for years. Jordan initially contested the rights of Qiaodan at the Trademark Review and Adjudication Board of the State Administration for Industry & Commerce and lost. After several lawsuits and appeals, in 2015 Jordan appealed to the highest Chinese court, the Supreme People’s Court. Fortunately, after this drawn-out multi-year legal battle the Supreme People’s Court ruled partly in Jordan’s favor. The decision, granted in December 2016, is now one of the leading intellectual property cases in Chinese law. In a significant victory, the Supreme Court’s decision granted Michael Jordan the rights to the name 乔丹(Chinese translation of Jordan) and ruled that Qiaodan’s three registrations of 乔丹 infringed Michael Jordan’s rights to his name. However, the Supreme Court partially ruled against Jordan when it decided that the company’s four registrations for QIAODAN (Pinyin of Chinese characters for 乔丹, the phonetic spelling of Jordan) and three registrations for QIAODAN & Device did not infringe Michael Jordan’s rights in his own name. The Chinese Trademark Law provides that a registration becomes incontestable after being registered for five years and cannot be invalidated based on prior rights unless the registrant obtained the disputed registration in bad faith as an attempt to profit from the good will of a well-known mark. In Michael Jordan’s case the main basis for the invalidation of the old QIAODAN registrations would have been Jordan’s name rights, but this was not enough to overcome the five year limitation. After the Supreme Court’s ruling, Qiaodan publicly announced that the three 乔丹 trademark registrations cancelled by the Supreme Court had only been registered in the past five years. 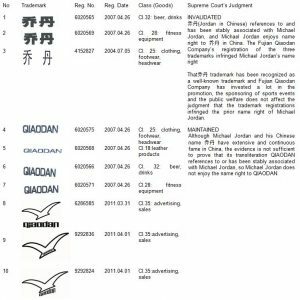 Qiaodan retained the other trademark registrations for 乔丹 in Class 25 for articles of clothing and footwear which Jordan could not challenge. Whether the Fujian Qiaodan Company is allowed to use these still-valid registrations for 乔丹 is uncertain. In our opinion, they should not be in a position to use them because if they do, Michael Jordan will institute an infringement action to stop such use based on the cancelled registrations. Moreover, Michael Jordan could, in a few years, move to cancel these Chinese registrations on the basis of abandonment. Jordan’s trademark actions in China will most likely continue. With the assistance of our Chinese colleague Yingshuo Xie of NTD PATENT & TRADEMARK AGENCY LTD, a brief list of these ten Chinese registrations is attached. The most important lesson to learn from the above proceedings is that any foreign party, be it a famous athlete or a company, should consider the protection of their marks in Chinese characters when entering the Chinese market. While companies or individuals often file Chinese trademark applications for their marks in Roman letters (since that is how they are predominantly used around the world), these parties must remember that Chinese people frequently interact with their marks in Chinese characters. It is extremely important to file applications in Chinese characters, or else they leave their marks vulnerable to unscrupulous third parties who seek to register the Chinese equivalent of their marks in order to unfairly profit. The complexity of Chinese characters (which may have different meanings and pronunciation) means that a careful analysis is necessary to determine if the proposed Chinese equivalents of these marks have a pleasant meaning, conform to the requirements of Chinese trademark law and can be pronounced clearly. Therefore, it is crucial to determine if the protection in Chinese should include the literal translation or transliteration of the mark, a combination of both, or a new character formation entirely. Many companies or individuals file for several Chinese character combinations. As always, when dealing with China the best approach is to first consult with IP counsel in the US who have excellent contacts with Chinese IP firms and a track record of using Chinese trademark law to protect its clients’ interests. Moreover, it is important to follow the same process as in the United States: run availability searches and apply for the registration of the Chinese character trademarks sooner rather than later! Diana Muller, expert in International IP law, Chinese trademark protection and defining worldwide trademark strategies for protection and enforcement of athletes’ names.